Kapitolyo definitely doesn't disappoint. It's a neighborhood of diverse cuisines that caters to everyone's quirky definition of delicious in a wide range of prices. Every now and then, different restaurants pop up waiting to be discovered, for everybody's dining pleasure. What was supposed to be just a visit to Egg-It (will be discussed in another post) turned into a 2-course meal. We ended up trying Pomodoro Pizza first and had the Hong Kong-style waffles as dessert. 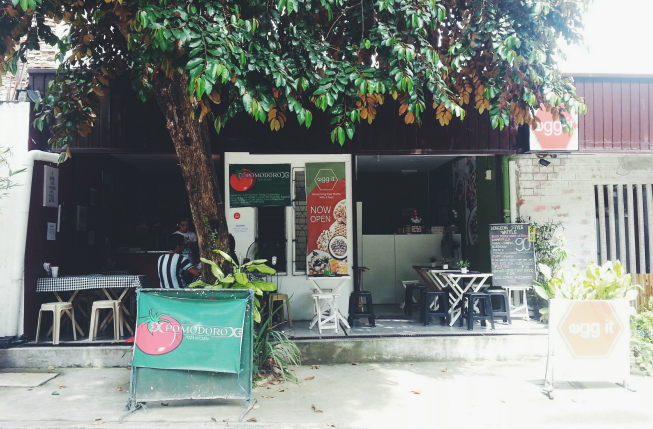 Pomodoro Pizza is located in the more unknown street of Kapitolyo (well, at least for us), and it's one of the few restaurants lined up there. They opened around March this year, and just recently, they announced that they are open until Sundays, 6:00 AM to 12:00 MN. 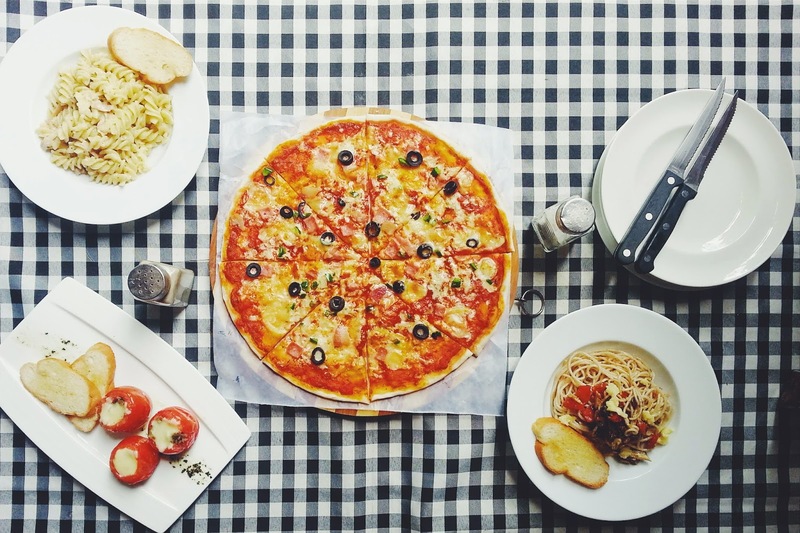 Though they offer an authentic Italian dining experience, it's a hole-in-the-wall type of restaurant so expect it to be no-frills and simple. 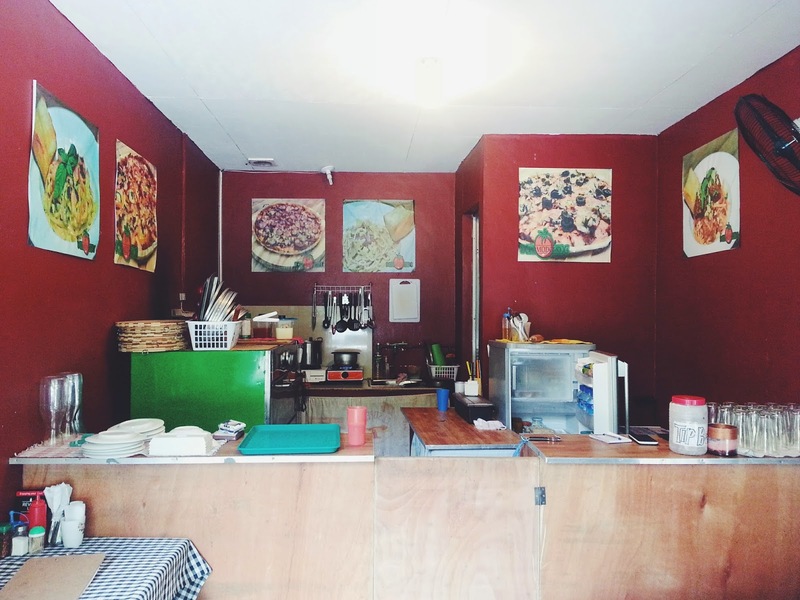 It's also specified on their menu that their pizza is hand-made and their other ingredients are fresh and not pre-cooked, so you may have to wait a little bit. 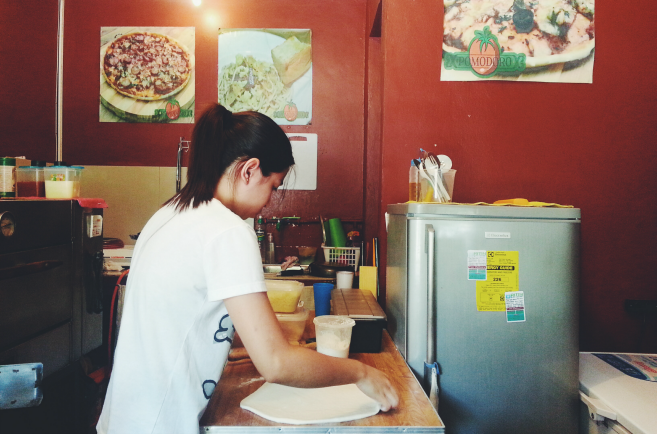 We had the House Special Pizza since Ate Michelle told us it was one of their best sellers. For myself, I ordered Stuffed Tomatoes (LOL dodging carbs like it's a freaking bullet), Charm had the Tuna Fusilli and Ian had the Bataan Tinapa Pasta. The House Special Pizza is a thin crust pizza with their signature Pomodoro sauce, onions, ham, bacon, olives, bell pepper, basil, cheddar, mozzarella, and another "secret" cheese. The pizza was delicious. *insert A-OK hand sign emoji here* For sure you could taste that the quality of the ingredients were not compromised despite it leaning on the affordable side. The Bataan Tinapa Pasta is light, with a really nice smokey tinapa flavor to it, not scrimping on the tinapa flakes and cheese, and also wonderfully seasoned with herbs and tomatoes. Yum! Lastly, the Tuna Fusilli is pasta topped with tuna simmered in home-made Bechamel sauce, pesto, bell peppers and cheese. It was a great balance of creaminess of the sauce and the generous tuna flakes, nothing overpowering the other. It was a super enjoyable treat that you'll not easily get tired of.